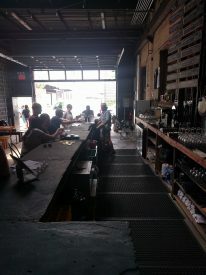 Fell off my healthy-eating bandwagon this weekend and cheated with some beers at Fifth Hammer Brewering. 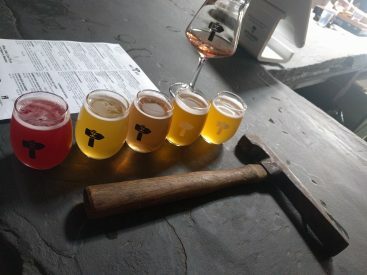 It was the perfect way to end the weekend, with tastes of their new seasonal summer sours and uniquely-infused beers. It started out as an innocent ‘taste’ of their 4oz pint glasses. How can anything that tiny and adorable be bad, right? The cucumber-infused beer was the most surprising I tried; the mild taste of pickles is not something you expect in a beer, which kept me perplexed, sip-after-sip-after-sip. That lead to a few more baby beers, ensuing in the most uneconomical way to pound a few pints of beer and unleash my undoing. The night ended in a fun walk home and a seamless order to the local diner: mozzerella sticks, chicken tenders and the best thing America has contributed to the world… scrumptious, savoury, sauced… meatloaf. Diet starts again tomorrow. < I BEAN cooking so much, it has been sub-LIME….